The members of the Election Commission are responsible for conducting all general and special elections in Tippah County. When contracted, the Election Commission assists the Republican and Democratic parties with the primary elections. The Election Commission is responsible for ensuring that all elections are conducted fairly, honestly and legally in all areas of the laws of Mississippi.They work as a team to ensure the voter rolls for Tippah County are as clean as possible by removing those voters who have moved or passed away. Members of the Election Commission are elected officials that serve a four year term and there are no limitations to the number of consecutive terms that can be served. Commissioners must be qualified electors in Tippah County and a resident of the Supervisor District in which they are a candidate. Commissioners are mandatorily required to attend annual Certification Training conducted by the Mississippi Secretary of State’s Office, to be certified to conduct elections. 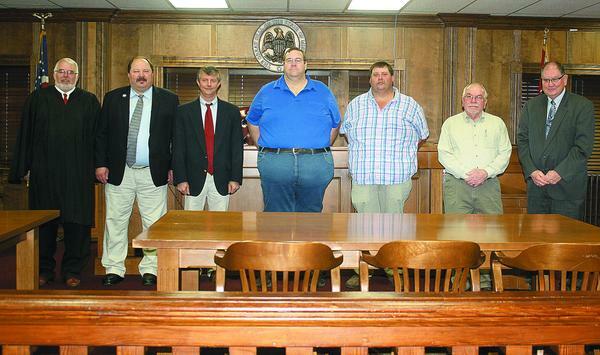 The Commissioners are pictured second from left in District order.